Federal and state regulatory requirements. The rates for our "expert" Home-Office Networking support services are among the lowest in the industry. 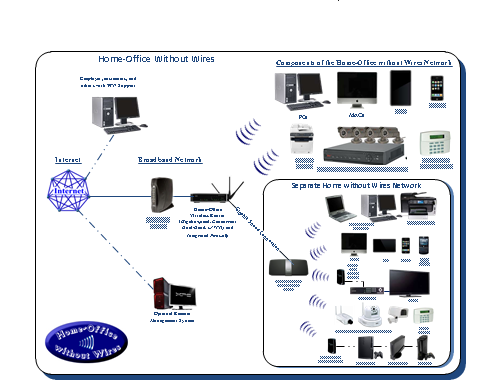 The diagram shown here illustrates how we will configure your home-office network so that it can exist and operate as a seperate, isolated entity yet share the expensive broadband network connections to the Internet with the home network. We utilize state-of-art wireless technologies such as 802.11ac with Beamforming support te ensure that your Wi-Fi network can support the requirement of your home and home-office. Please Call (602) 478-4778 or (623) 979-1827 for more information or a free, no-obligation quote.